I’ve recently migrated web host to Hostgator and have to say that’s it’s much more stable and reliable then my previous host. 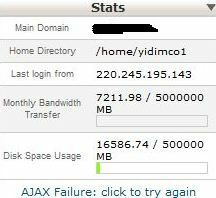 Previously, I had my web hosting account with Anhosting/Midphase who had served this blog happily for the last 2 years. But strange things started happening mid June when my account was migrated to a new server and Tech Support kept suspending my account quoting that my wordpress blog was using too much CPU resources. index.php and wp-cron.php were showing up in their logs but doesn’t make much sense even though I tried disabling a few wordpress plugins but still came up short. Their suggestions were to get into a VPS hosting or a dedicated web hosting to solve my problem. Having used shared web hosting for all through these years, I wasn’t even considering getting a VPS/dedicated hosting as that would be overkill IMHO. Hence, I went shopping for a new shared web hosting provider and found Hostgator. I called their tech support and found out that they can help me move the whole account from my old host to hostgator, as in getting all my files, cpanel + mail settings + database from my old web host and put them live again on Hostgator. All my old web host needs to do was to package up a cpanel backup, and hostgator will download it and set it up for me. Great. I went ahead and registered for a shared web hosting account which was really easy and I got my account activated in less then 30 minutes. First thing I noticed in Hostgator’s cPanel was a “Statistics” view in the sidebar. This is really important for me as I’m now no more in the mercy of whatever the tech guys were trying to tell and sell me since this piece of information allows me to have a bird’s eye view of how much resources my blog is really consuming. If you’re looking to get or migrate to a new web hosting account, I highly recommend you to check out Hostgator. I’m currently happily subscribed to their Baby plan (shared web hosting) with features such as UNLIMITED Domains, UNLIMITED Disk Space, UNLIMITED Bandwidth and UNLIMITED MySQL Databases for just $7.95/month.